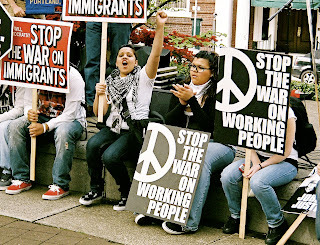 Portland May Day: March and Rally for Immigrant and Workers' Rights! Economic Justice for All! March and Rally for Immigrant and Workers' Rights! Economic Justice for All! We invite you to join with us to organize the May Day Rally and March. As the Economic Crisis deepens, and immigrants and union workers--not greedy CEOs and bankers--are blamed, it's time for our movements to come together. May Day has a rich history going back more than a century as workers fought for the eight hour day. May 1st is now celebrated around the world as International Workers' Day, and has been celebrated for years in Portland. In 2000, a May Day march that brought together four campaigns (low-income housing, immigrants' rights, environmental justice and workers' rights) was violently broken up by the police. In following years, activists fought for the right to protest and won. In 2006, the May Day march focusing primarily on immigrants' rights was one of the largest marches Portland has ever seen, with estimates up to 40,000. This year, we see an opportunity to make the connection between the economic crisis and the rights of workers and immigrants, and demand not just an economic recovery, but a whole new economy that works for all people. In the last election we raised our collective voices to call for real change, but the recent ICE raid in Bellingham shows that there is still much work to be done. Organizing meetings are Tuesdays, 6:30pm at Voz, 1131 SE Oak St. from now until May 1st.